You are standing in your local “Big Box” electronic store deciding to buy a new computer. You finally decide on one within your budget. Next thing you know, you are paying for extended service warranties (which I do recommend when purchasing a laptop), and setup charges. The typical Big Box store charges $99.99 for computer setup, including Recovery DVDs, and $99.99 for software installs. These two “services” can be performed in less than an hour and you can do it yourself saving $200. 1. System Recovery Discs – new computers do not ship with operating system discs. Depending on the computer brand, you may or may not have a recovery partition. Most laptops come with a recovery partition, which contains the operating system files. The recovery partition would be used to re-install the factory default operating system. Most netbooks do not come with a recovery partition, and you must create recovery discs if the operating system ever needs to be re-installed. Launch the program and follow the instructions on the screen. You will need a DVD burner and approximately 2 DVDs. Please refer to the manufactures website for additional details and instructions, if required. 2. Remove any unwanted software which came installed on the computer (optional). Most new computers come with “crapware”. Usually this is trial software. I like to remove it, if I am not going to use it. If you are unsure of which programs to remove, speak to an IT Professional. If you accidentally remove a program you did need, you have the recovery disks you just created in step one. 3. Install Antivirus. There are many Anitivirus (AV) programs to choose from. The big box stores will try to sell you an AV program, or as part of the service package, they will install Microsoft Security Esssentials™ for you. Security Essentials is a free download from Microsoft. Go to http://www.microsoft.com/en-ca/security_essentials/default.aspx to download this software. 4. Run system updates. The computer may have been sitting in a box for a few months, and the operating system could be out of date, potentially leaving your brand-new computer unprotected. 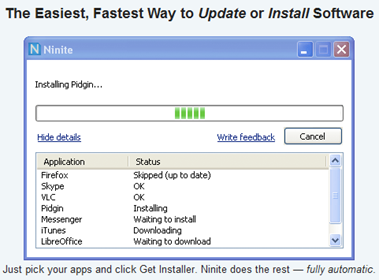 Using Ninite.com will save you hours of installation time. 6. Create a System Image (optional). A system image can be used to restore your system to the same point in time from when the image was created. Once the system is completely configured create a system image. To create a system image in Windows 7, click Start – Control Panel – System and Security – Back up your computer. For detailed instructions visit Windows 7 Backup webpage. There it is, 6 easy steps you can do yourself in about an hour and save a couple of hundred dollars. If you still prefer to have someone else do this for you, hiring an IT Pro will usually cost less than the big box store pricing. *Pricing is in Canadian dollars.